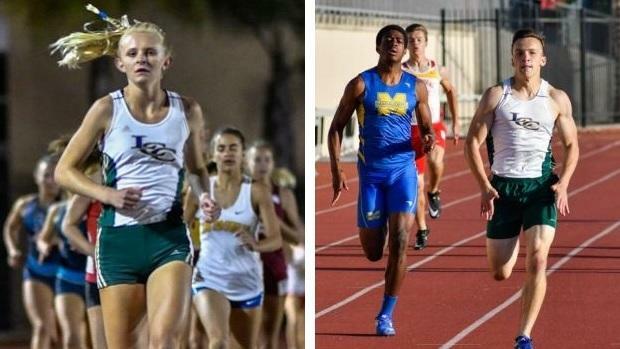 Every section in California has its favorites heading into the state championships, but they have to survive section prelims and championships. La Costa Canyon's Karson Lippert couldn't do it after suddenly grabbing his left hamstring 50-meters from the finish line of the 4x100 relay, hopping across the finish line before collapsing in the San Diego Section prelims Saturday at Mt. Carmel High. When it came time to run the 400, where the junior was second in the state last spring at 46.85 seconds and the 200, where he went a wind-aided 21.28 just a week ago, he was unable to participate. His two closest rivals in the 200, Madison's Kenan Christon and Mt. Carmel's Quoi Ellis, said he will be missed. "He was going to be in my heat (of the 200)," said Christon, "and when he couldn't run, there was no one to push me. He's a great competitor." Ellis was even more disappointed. "I'm distraught," said the Sundevils senior. "My prayers go out to him--I wish him the best. There's no way he deserved this. I hope it doesn't happen to him against next year." The trainer who treated Lippert said it was probably a high hamstring pull and that it would be up to the athlete, his parents and the coach whether he would even try to return since technically he could run in the short relay. Coach Bill Vice clearly didn't expect it to happen. "No, it doesn't look good," said Vice. "It's devastating as a coach and for Karson. He's so humble and such a hard worker. Rarely have athletes come back from this kind of injury. He was clearly ready for a sub-47." Although she was battling a cold, LCC's McKenna Brown, among the state leaders in the 1600 and 3200, cruised to the fastest times of the day in both events, looking forward to doubling in next week's championships. Her times of 4:59.53 in the 1600 and 10:48.88 were well off her bests of 4:45.46 and 10:15.97 but she said she's ready to compete in both at the state meet. "The 1600 is still my best event, despite setting the (San Diego Section) record in the 3200," said the Cal-bound senior. "I can do the 1600 before the 3200 at state, so why not try it?" Her teammate, Kristin Fahy, the hard-luck runner in the state cross country championships, dropped the 1600 and will focus on the 3200. Rancho Bernardo's Jacob Rice, who took the pole vault section lead at 16-2 a week ago, pushed it to 16-3 before missing three times at 16-7. His final attempt was his best, getting high enough but hitting it on the way down. LONG DAY Coronado's Alysah Hickey seemed to be all over the place. After her 4x100 relay leg, the Islanders' junior checked in to the long jump, 100 and high jump. The two field events were being contested at the same time, so she bounced back and forth, hitting 19-2 ½ in the horizontal jump before clearing 5-6 in the high jump. A 5-10 jumper, she missed three tries at 5-9. "I thought I'd die in between events," she said, noting that she had to leave the high jump and long jump to win her heat of the 100 in 12.22 seconds. "I was looking to make sure they didn't put the high jump bar to 5-4 while I was waiting to for the 100. I'd already gone 19-2. "When I got back to the high jump, the official told me to get ready, they were going to 5-4. Whew!" San Diego High Tech High's Josh Rosenthal recalled how when he was a freshman, he saw Cathedral Catholic's Joaquin Martinez de Pinillos run 4:17 in the 1600 and marveled at the accomplishment. "I idolized those runners," said Rosenthal, who started working harder and harder until this year he surpassed them all, coming in with a 4:13.64 at Mt. SAC. He had the fastest qualifying time of 4:19.98 in the 1600 prelims but he's still leery. "(Westview's Marshall) Brooker has great finishing speed and he's the one I have to beat. I'm hoping I have a nice lead on him going into the final 400 next week." Booker qualified with times of 4:22.79 and 1:56.83 in the 800. San Diego High's Sonia Redon and Valley Center's Jeremy Clay led the section in the short hurdle races. No one was surprised that Redon, a junior, dropped her 100-meter hurdle best by three-tenths of a second to 14.65. "I knew it felt kind of fast but I didn't expect to go THAT fast," said Redon, quickly readjusting her goals. "Now I want to get under 14.5." As for Clay, he was just happy to be competing after missing six weeks of the season and returning right before the league championships. He had the fastest time of the day at 14.78, which didn't match his PR of a week ago of 14.59 but was faster than section-leader Tyler Saikhon of El Centro Southwest, who easily qualified at 14.85. "That felt really good," said Clay with a wide smile. "It's amazing to be back--God has blessed me. Now I can work hard for another week.